Most of the cars you hear about at Barrett-Jackson auctions are big-buck restomods and even bigger-buck supercars, but there’s still a contingent of bargain sports cars that cross the block, especially in the first couple of days. We’ve rounded up three of our favorites that fit that bill, all from the 1970s and all running on Friday, April 12—the second day of Barrett-Jackson’s 2019 Palm Beach auction. Be sure to catch all the auction happenings live on MotorTrend On Demand or on the MotorTrend Network. 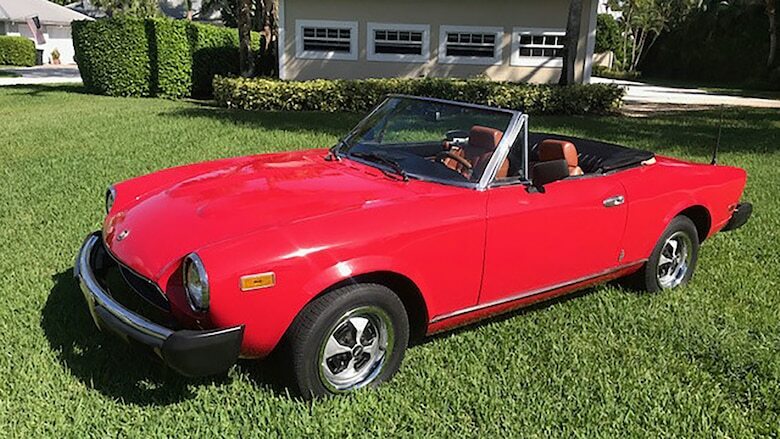 By 1979, the Fiat 124 Spider had already been on the U.S. market for some 11 years, and after making only evolutionary changes over that period, Fiat saw fit to change things up with . . . more evolutionary changes. One of these was to enlarge the “Lampredi” twin-cam engine a final time, from 1.8 liters to 2.0 liters. Induction was still via single carburetor, but the displacement bump gave the Spider something it had little of before: torque. The name was changed from 124 Spider to Spider 2000 to symbolize this improvement, but for the most part the rest of the car carried over. The big rubber and steel bumpers the Spider gained in 1975 were still present, but so was all the good stuff, including a five-speed manual gearbox and four-wheel disc brakes. This example looks to have undergone a cosmetic refresh and we’d say its current value should be a grand or two shy of $10,000—which is about the cheapest you’ll get an honest-to-goodness, Pininfarina-designed Italian sports car for these days. Like the Fiat 124 Spider, the MGB had seen better days by the time the mid-1970s rolled around. The once svelte chrome bumpers gave way to blocky rubber units and smog regulation had taken a toll on engine output. Because the bumpers and headlights now had to meet minimum height standards, the MGB also had to be fitted with a slightly taller suspension for the U.S.. The good news is that virtually all of these detractions are reversible, and the consigner has already started by replacing the standard-for’77 steel wheels with vintage knock-off, wire-spoke pieces. This particular car has been updated with wood dash panels, electronic ignition, and a host of other improvements, which may help it crack the $10,000 mark. In any case, this is an excellent car to dip your toes in the classic British car scene for limited money. When the Datsun 240Z launched in the U.S. in 1970, it was an elegant, sophisticated and performance-driven sports machine that showed how dated budget European sports cars had become. By 1975, the 280Z had launched with 2+2 seating and an increase in displacement from 2.4 liters to 2.8 liters, while the car’s dynamics were now tuned more to boulevard cruising than back-road blasts. Nevertheless, this car is a rare survivor showing just 20,000 miles and original Leaf Green paint. With a four-speed manual transmission, at least you can row your own gears, which is more than can be said for many modern sports cars. We’d pay up to $15,000 for this one as long as its headed to a Z-car collection where it will continue to be preserved and carefully driven.